LANKO HIGH GRADE GROUT 100 can be used in all grouting situations where shrinkage is undesirable and high grout strength is required. Primary uses for LANKO HIGH GRADE GROUT 100 are : bedding, filling and grouting applications where complete filling of voids with a high strength non-shrink material is required. It can also be used for spiral connector and underplate grouting, repairs to precast concrete, bedding bearing plates, anchor bolt fixing, cable grouting and crane rail assembly. 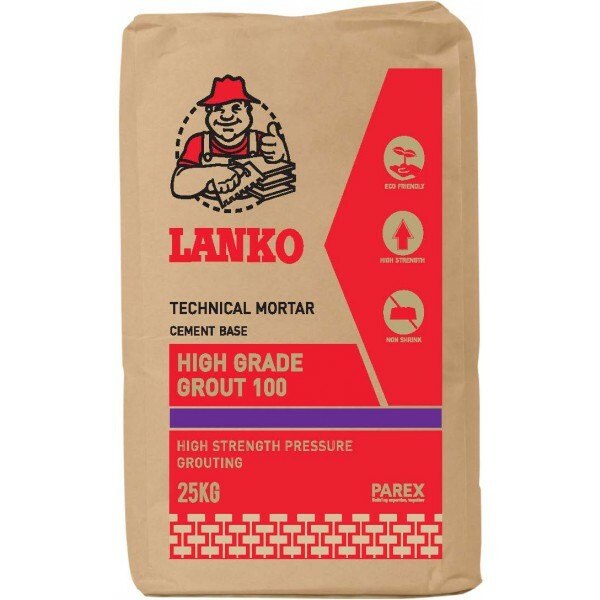 LANKO HIGH GRADE GROUT 100 is a flowable grout, free of bleeding, settlement and shrinkage. Consistent high strength performance as all ingredients are premixed in the factory.